A week ago (or so) I mentioned Foodpanda Summer Food Festival and how I plan to do a follow-up blog after ordering different things during that week. Well, it's time folks, I am going to share my experience, mini review on the food I ordered as well the reason why I will always order through Foodpanda. 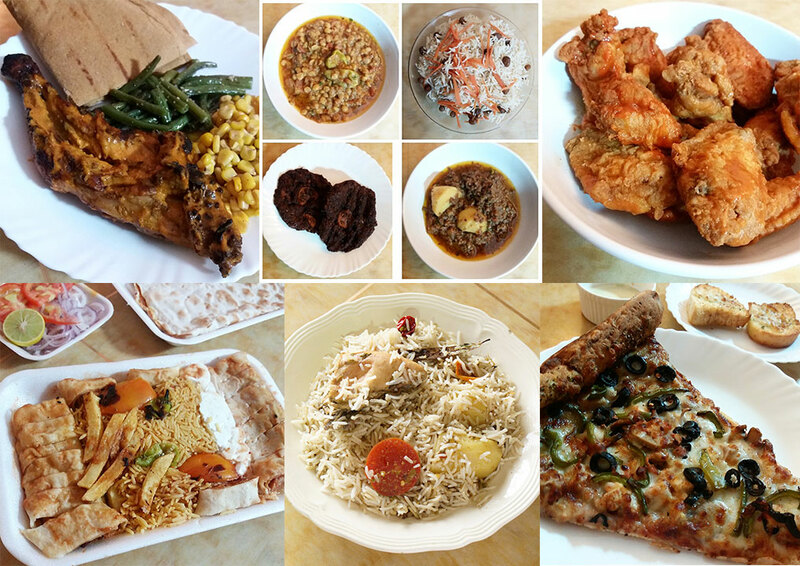 I order frequently from Foodpanda.pk, once a week is very normal for a gastronome like me. The best part about ordering from Foodpanda is not just the numerous food choices but also the ease of placing an order, be it through the website or the app. I prefer the app because I just select what I want and order with a click, voila! No more messy phone calls and waiting while being tortured with recordings of cheesy promotional material on repeat mode. Life is so much better now. My mom was craving some. Truth be told she still doesnt accept it as a biryani but enjoys the flavoursome rice dish as a pulao, of sorts. 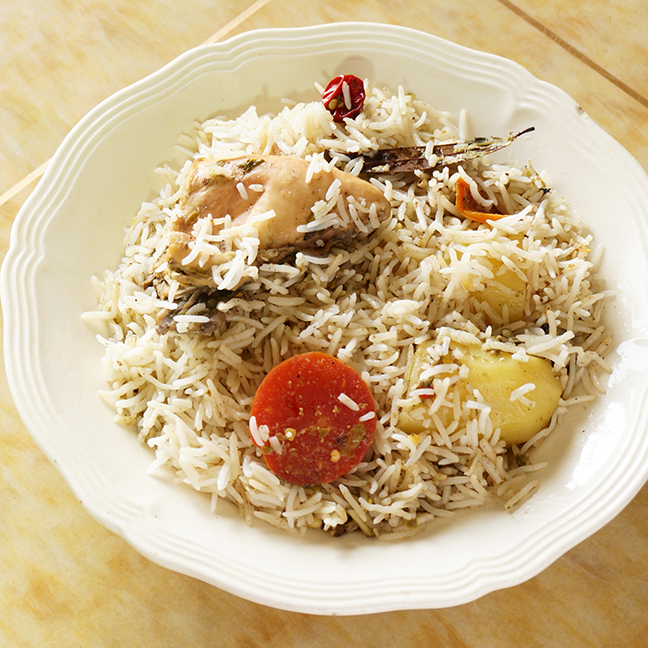 What I always fancied about White Biryani is that it always arrives fresh and hot. Ordered it many times and they never failed to impress, so far. The grease is non existent, the rice is fluffy and the spices are balanced with a mild peppery after taste. 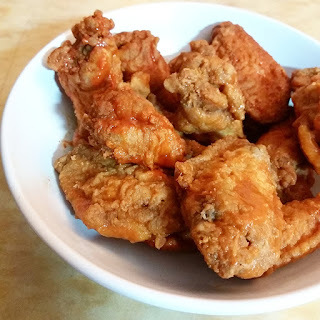 Their chicken is usually cooked but not as moist as it ideally should be, but the soft rice texture helps covering up, leading to a satisfied appetite. So as my mother got to choose on day 1 it was my father's turn and he opted for pizza. I ordered a very wholsome, handtossed, chicken fajita pizza. Portion size per slice is fit for a king, I was only able to eat half. 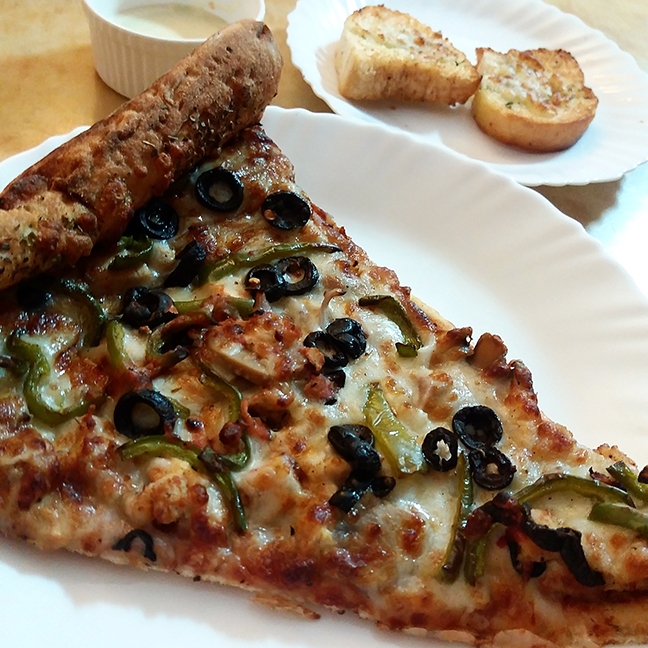 Unless you have a big apetite you are good with just a slice. The bread was greasy, I prefer tasting less oil and more cheese and meat. The pizza toppings were not scarce and every bite was a mouthful which I relished. I was in the mood for some Turkish Pide but then finally opted for Lahmajun ( Thin naan bread with mince filling) and Beyti Kebabs from Solen Istanbul. First thing I noticed was the portion, it was more than I expected but that was good news for the rest of the family who never shy away from trying food. 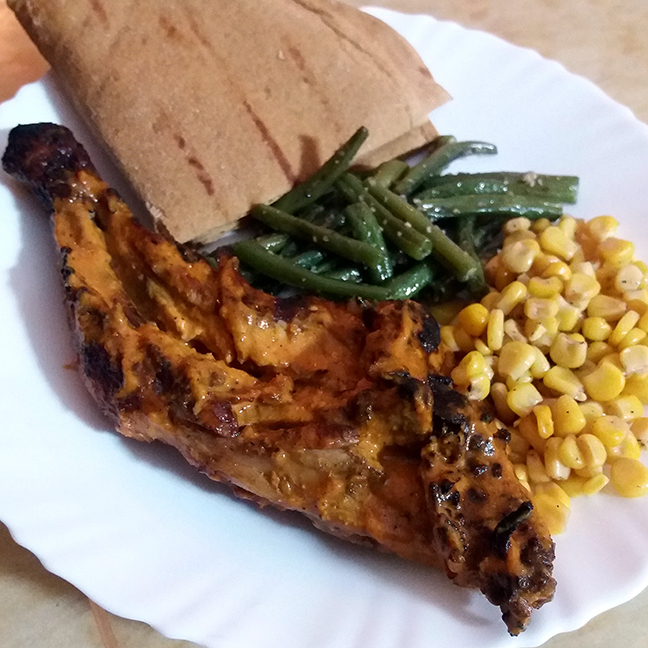 After feeling guilty for eating more carbs than allowed I opted for Flame Grilled Chicken from Rotisserie with sidelines of corn and green beans. 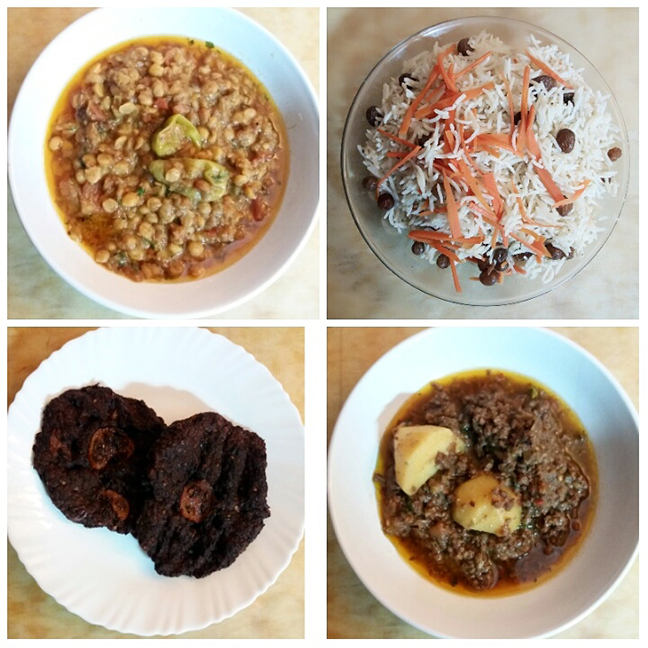 I went for the mild flavor served with garlic sauce, row sauce, tabouleh, pickle & pita. This place is one of my favorites for grilled chicken, perhaps the only one who does it right. Many consider cooking chicken easy but we truly dont understand how important it is to make a beautifully moist yet tender chicken, cooked to the bone without any element of pink apparent. All that, while retaining flavor, that is a well cooked chicken. Should I say more? This was a surprise for me. Who knew that that they served more than just chapli kebabs? Not me! I randomly ordered this and was amazed with the taste explosion though I am not too sure about the unnecesary quantity of oil, the only bothersome deal. The Chapli kebabs were moist with the right about of flavor mix, that subtle sweet and sour after taste was also not overwhelming. The Channa daal was thoroughly cooked with tomato and green chilli flavors not crossing eachother out. The Allo qeema was extra greasy. The oil subdued the actual flavors so much that I was unable to really understand it. The value for money was good considering the generous amount of food you will get. I like Wingitt not just becuase of the variations of sauces they have but also becuase they have one of the juiciest wings that are actually bigger in size than any other you will get in Karachi. You get more than a mouthful, eventually ending with a full tummy when you are done with your plate. I ordered the original Buffalo Sauce along with Wasabi Sauce. I had already tried Wingitt Buffalo wings many times in the past and the tangy, hot sauce with the juicy chicken never lets me down. I ordered wasabi wings for the first time and didnt find the feiry kick that wasabi is packed with apparent in the flavor. They definitely need to add more punch to it. On the 7th day I was pretty much resting in bed with just occassional Joshanda or Soup becuase the summer flu had taken over. My parents were very much hungry for some BBQ so I tried Jaan Jees BBQ instead of their usual broast. I didnt taste anything but the feedback was not impressive. 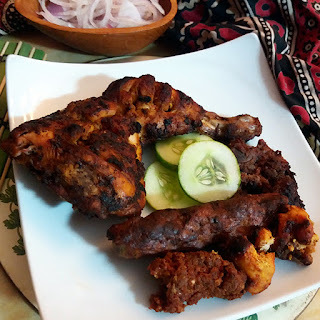 As per my parent the masala (spice mix) was bland and the meat over all was too dry and hard to chew. They also didnt have any option of naan or chapatti which is a point to be noted. *Subject to change after adding Delivery as per your location as well as Tax. Yummy.. nice to see and know more details about the food mom mentioned. This is a delicious, mouth watering post. 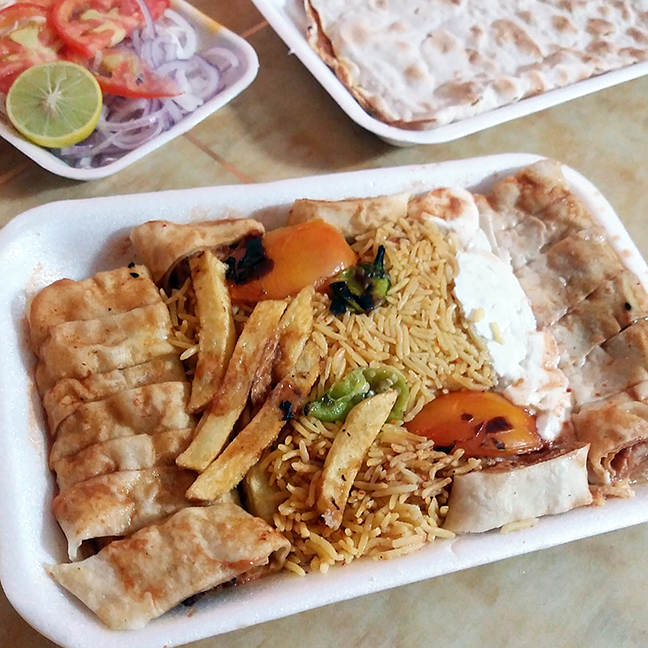 Food Panda is amazing but there are not many option in Lahore like Karachi. Awww I hope that they start giving more options for Lahore! Okay Your post is so awesome plus I love the way you photographed it. I so badly want that grilled chicken now. This was one yummy and interesting post.